A few weeks ago I was eating lunch at an elementary school and sitting next to the building sub. She was drinking something pale green and there were things floating in the liquid! I asked what the heck it was and learned that every morning she makes green tea and puts a spoonful of chia seeds in it. I was struck by the fact that she did it every day. To my mind that meant that there was good reason for this drink. So I felt I would investigate it myself regardless of my memories of weird chia pets that were advertised on TV decades ago. 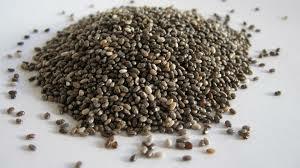 So I googled chia seeds and found this paragraph in Wikipedia: “According to the USDA, a one ounce (28 gram) serving of chia seeds contains 9 grams of fat, 5 milligrams of sodium, 11 grams of dietary fiber, 4 grams of protein, 18% of the recommended daily intake of calcium, 27% phosphorus and 30%manganese. These nutrient values are similar to other edible seeds, such as flax or sesame.” That is a whole lot of nutrition. I also read that ancient Mexicans like the Aztecs cultivated it as a major staple food. WebMd had some kind words for chia seeds, mentioning their Omega 3 fatty acids, carbohydrates, protein, fiber, antioxidants, and calcium. It suggested they can be sprinkled on foods, put in breads, and used in beverages. The focus of the WebMd article was whether they help with weight loss. It concluded that more study is required before such claims can be verified. Nuts.com had a list of seven benefits to eating chia seeds. I would be happy to have 3 or 4 of those benefits! So chia seeds in my tea? Maybe yes! I personally have always felt green tea was rather blah in flavor. I drank it occasionally but not with any enthusiasm. The addition of chia seeds to tea might be fun I thought. I tried them a week ago and I think I am hooked! Here is my simple recipe. I make a large mug of green tea using one tea bag, be sure to let your boiling water cool a minute before adding the tea bag. I brew for 3 minutes. Then I add ½ a teaspoon of local honey. Bechdolts is my source for great honey. The typical honey in your supermarket is somewhat suspect as to quality. Best to get it as close to the bees as possible! Many people think there are health benefits for allergies to local honey. Maybe, I just think it tastes much better and is not adulterated as I fear much commercial honey is these days. I digress. Anyway, I put a tsp of chia seeds in a small dish, add about ¼ cup of filtered water and let it stand as the tea cools. In about 15 or 20 minutes I add the chia seeds which have swollen with water to the tea. Stir well. I like to put a couple ice cubes in a glass and add the chia tea. Sometimes I put it in my water bottle and take it to where ever I am going. You can use any type of tea. 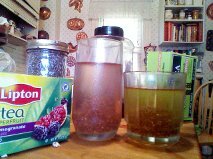 I have several flavored green teas and chia seeds are great in all of them. It works fantastically in plain green tea. 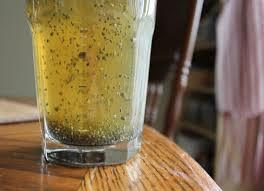 I love the addition of these slightly weird slippery balls of chia seeds spinning around in my tea. They make it much more interesting to drink. I like to stir it up or swirl it around so I get a few slithery seeds in each sip. I am positive it will work great for your favorite herbal tea or black tea. So use what ever tea you prefer and have a silly iced chia tea time! Some recipes put as much as a tablespoon of chia seeds in each cup. I suggest you start with a teaspoon and see how you like it before considering increasing the amount. And many recipes just put the chia seeds right in the hot tea without soaking them; feel free to do that if it makes life easier! My healthy green tea is much more playful and nutritionally improved by this small addition. I get nutrients and fiber and fun! I find myself drinking more green tea, maybe 3 or 4 times as much as I used to. This hydrates my body in this hot weather which is a real benefit. It is cheaper and considerably healthier than commercial ice teas which can be laden with sugar and a variety of not so healthy additives. Goes without saying that it is gluten free too! Try it and you will be happily hooked on chia tea too.